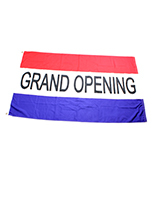 This sale flag will make passersby gravitate towards your business! The message flag, sale flag has a universal red, white and blue design so visitors are familiar with its message. 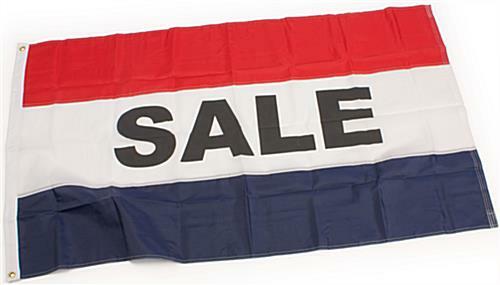 This sale flag, also known as attention banners, features the word "sale" written in black, bold letters. The black lettering beautifully contrasts the flag's white background, making your flag easy-to-read, even from far away. We provide the sale flag with a large, 5'2"w x 3'h size so that passersby are able to view your outdoor advertisements with ease. The flag itself will not, however overshadow your company logo or outdoor presentations. The sale flag is made from nylon to create a more attractive and longer-lasting outdoor display, when compared to polyester flags. 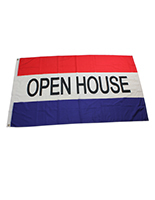 This red, white and blue banner, sale flag is equipped with (2) brass grommets for easily attaching to a flag pole or stand. This sale flag also includes a 2" canvas header for added protection and durability. Feel secure in knowing your sale flag will last through years of use! The sale flag, such as a message flag, has a simple yet effective design to draw further traffic into your retail store, restaurant, café or salon!